Hi Folks, I am having a bit of a 2000Ad renaissance at the moment but while painting up my throng of Judge Dredd miniatures I managed to fit in two legendary Fishmen, these miniatures originally appeared on the Rogue Trader RT2 Flyer March 1988 along with the legendary Wolfen, it would be interesting to know if the Wolfen was another repurposed Fiend Factory miniature. "Sometime in the mid-1980s Bryan Ansell had some Sci-Fi Fishmen made based on Citadel's Fiend Factory FF65 Man-Fish models. See CCM for pictures of the originals. 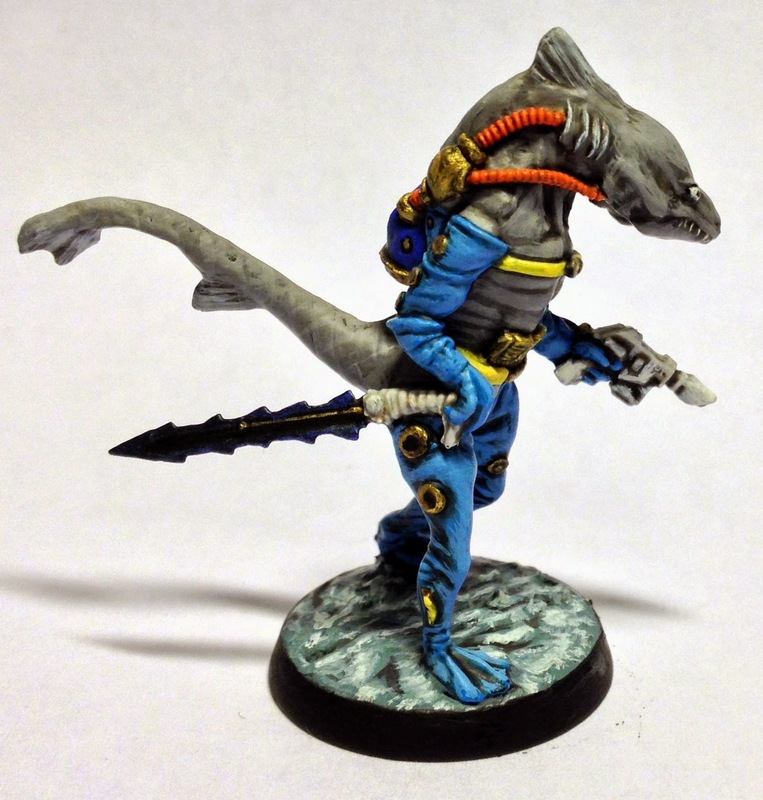 These "Fishmen from Space" were used to playtest Laserburn and then WH40K but were never sold to the public. Fast-forward to 2012 when Wargames Foundry discovered the moulds of these in their back-catalog and created a new production-mould. These figures are sometimes available from Wargames Foundry directly or as giveaways at events." Try giving Wargames Foundry a ring or email they may be able to sort you out with these miniatures. There was talk on the Oldhammer forum and associated Facebook group that Bryan Ansell searching for the third Man-Fish miniature so the he could convert it to a Sci-Fi Fishman thus completing the range." They would make good fishy henchmen for my Space Riders Picsean Warrior. There are other excellent painted examples out there on the web, here is a superbly painted example by Paul over on his Sho3box blog. Nice painting - and great old miniatures!